Any woman who has fine or thin hair knows how hard it can be to style. When you are a bride (or a bridesmaid, for that matter), the thin hair problem becomes even more pressing, because most formal hairstyles are full and lush. However, that does not mean that a bride without a full mane has to resign herself to having a bad hair day for her wedding! These are come practical tips on wedding hairstyles and bridal hair jewelry for fine hair. There are several things which you can do to add more fullness to fine hair, depending on how much time and money you are willing to put into your wedding hairstyle. Brides who want to make a dramatic difference find that having extensions woven into their natural hair can create a lush effect that no hair styling product could ever rival. The extensions are used not just for length (although they certainly can be useful for that as well), but to make it look like you have more strands of hair. When done well, the results are very natural and last for about three months, depending on how fast your hair grows. If you are more inclined to work with the hair which you already have, there are still some beautiful styles which can be created for your wedding with thin or fine hair. Gentle backcombing at the front of the head will provide lift at the crown, in turn creating a fuller appearance. To keep hair from falling flat, use hairspray after backcombing. This style will work best if the front section of hair is then pulled back and secured so that the weight of the hair doesn't pull down the section that was teased. A tiny clear plastic hairband works very well in fine hair. For a classic half-up hairdo, cover the plastic band with a small section of hair wrapped around it. 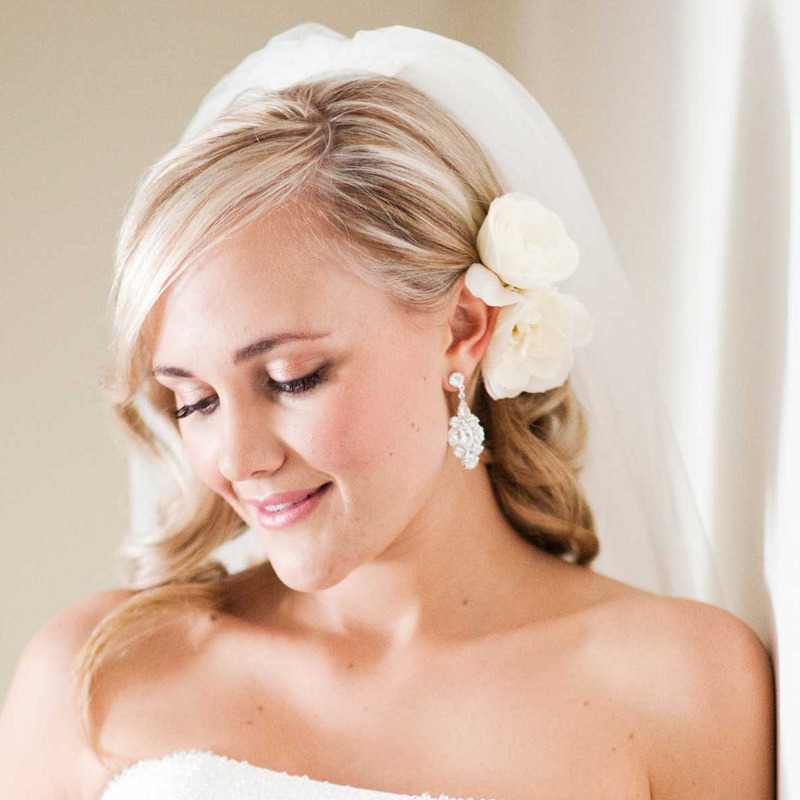 Updos can also work beautifully for brides with thin hair. As with a half-up 'do, the stylist will probably start with a little backcombing to add more volume at the crown. The back of the updo can be made to look more full by using a curling iron on sections of hair before forming into a style. You would actually be amazed at how "big" your hair can look using this technique! Back in the 1960's, it was common for women to use pads over which they would wrap their hair to create the dramatic beehive hairstyles which were so popular. A small pad could be hidden under the back section of the updo to give a natural looking boost to volume; just no Bump-its, please! The one style which is best avoided by any bride with thin hair is wearing it all down. No matter how much volumizing product you use or how carefully you curl your hair, the style is bound to fall flat well before the end of the wedding reception. If you have at least the front section of hair pulled back into a style, it will maintain a more polished look, even if the loose section starts to wilt. You will also find it virtually impossible to secure a veil in fine hair without some sort of hairstyle into which to anchor the comb. That brings us to a major concern of brides with fine hair: what type of bridal hair jewelry and veil will work with their hair texture? The best bridal hair jewelry for fine hair is a headband. Since it is shaped to your head, rather than tucked into your hair, it will stay in place far better. There are many gorgeous options for jeweled headbands available these days, as it is a very popular fashion trend. A double headband can be even better, because you can place the comb of the veil in between the two bands, which gives it something to catch instead of slipping. A petite wreath is another style which works with fine hair, if the woodland fairy effect is your style. Hairpins can work in an updo, as long as they are on short enough pins (long pins will stick out the other side of your 'do!). Of course, if you have opted to get extensions, any type of bridal hair jewelry will work. While working with fine hair can be a challenge for a bride, without a doubt you will be able to create a style which looks beautiful and will last all day.